Silva ADC Pro Wind Speed features a waterproof housing, a large clear LCD screen with full graphic information and graphs and LCD illumination. 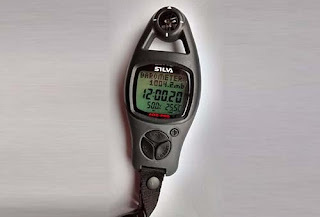 The Silva ADC Pro Wind speed precisely measures, wind speed ( current, max and average) , temperature ( current, windchill and min windchill) along with having a clock, with date and an alarm and a cronograph with race timer. In addition the Silva ADC Pro wind speed has a built in altimater/ barometer offering ( current, max, min) , weather forecast and data log memory ( 1984 readings) , Relative humidity ( wet bulb, heat index, air density) and it also compatible with the ADC IR ( optional accessory) for infrared communication with your PC via your USB port. We serve purchases and shipments to Banda Aceh, Medan, Padang, Pekanbaru, Jambi, Palembang, Bengkulu, Bandar Lampung, Pangkal Pinang, Tanjung Pinang, Silva ADC Pro Wind Speed, Yogyakarta, Bandung, Semarang, Surabaya, Serang, Denpasar , Kupang, Mataram, Pontianak, Palangka Raya, Banjaramasin, Samarinda, Tanjung Selor, Manado, Palu, Makassar, Kendari, Mamuju, Gorontalo, Ambon, Sofifi, Jayapura, Manokwari and the rest of Indonesia. And can COD / Free Ongkir for the Jakarta area.